The first product on this list of the best fish oil pills are the Nature Made Burpless Fish Oil Pills. This is pack of 320 soft gels with 1000mg of fish oil and 300mg of omega-3 in each capsule. The capsules are also made from oceanic fish instead of farm-raised fish to make sure that you are getting the most organic source of fish oil. These dietary fish oil supplements are also made from a burpless formula to make sure that there is no bad mouth odor afterwards. These supplements are a great addition to you routine diet and will help you reduce the risk of heart attack. They are made from natural sources to ensure benefits without any health risks. Another product on the best fish oil pills list is the Kirkland Signature Fish Oil Concentrate. This is a pack of 400 soft gels with 1000mg of fish oil in each capsule. These supplements are made from concentrated omega-3 fatty acids of 300mg. These capsules are great for anyone who is unable to include seafood in their regular diet. They will help you complete your nutritional value and therefore look after your heart health. Fish oil and omega-3 fatty acids take active part in reducing risk of heart diseases and heart strokes. By using these fish oil supplements you will be able to provide maximum benefits to your body. Nature’s Bounty Fish Oil Pills is another product on the list of the best fish oil pills. These supplements have 2400mg of fish oil in each capsule of 90 soft gels per bottle. They also include highly concentrated amount of 1200mg of omega-3. These fish oil supplements are made with an odorless formula so they are easy to swallow and do not leave bad mouth breath. In addition, Nature’s Bounty Fish Oil supplements are made to be twice as potent with EPA/DHA to increase the beneficial qualities of taking them with your daily diet. They will noticeably reduce your risk of cardio diseases so you can lead a healthy life. This pack is ranked as one of the best fish oil pills as it contains 120 soft gels with 1200mg of EPA and 900mg of DHA. Overall, there is 2250mg of omega-3 fatty acids in these pills to offer you a high amount of contents that your body needs to keep you healthy. Additionally, these supplements are also made with triple strength formula to give you three times more than other fish oil supplements. They are also pure and refined to minimize any potential risks. 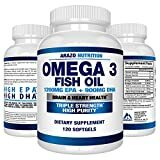 In short, Arazo Nutrition Fish Oil Pills will be a good addition to your diet to provide support to heart health and avoid heart related diseases. Omegaboost Fish Oil Pills makes it on the list of the best fish oil pills has as it uses quality ingredients only. There are 120 softgels per pack with 1250mg of fish oil in each capsule. The most interesting thing about these capsules is the fact that they are lemon flavored so they are easy to swallow. Additionally, they will also help you avoid any bad odor. The top fish oil supplement will help you promote heart health, hair health and balance blood pressure as well. There are many benefits of using these fish oil pills and if you are unable to add omega-3 foods in your regular meals, you can use these supplements to overcome the lack of its beneficial qualities. This Viva Naturals product features benefits that rank it among the best fish oil pills available. There are 180 capsules per bottle and each pill contains 2200mg of fish oil. Moreover, every capsule also has 1400mg of EPA and 480mg of DHA. These capsules are made from concentrated amounts of fish oil to provide you all the benefits of omega-3 fatty acids. If you want to take a step towards living a healthy lifestyle, you should add these fish oil supplements to your daily routine. They will reduce the risk of cardio diseases while simultaneously maintaining your blood pressure to a normal rate. Fish oil and fatty acids are also useful for overall health and give you luscious hair, good eye sight among other things. Another product among the best fish oil pills includes 300 capsules in each pack of InnovixLabs Fish Oil Pills with 900mg of omega oil in each. These supplementary pills are also made with triple strength formula to offer health support that is three times more compared to others. Furthermore, these capsules are also molecule distilled for maximum safety which means there are no health risks to taking these. They are enteric-coated fish oil supplements which are easy to swallow without any bad odor afterwards. 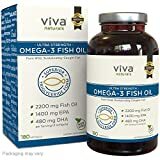 If you want to lead a health-conscious life you can use these fish oil supplements to promote overall health especially balanced blood sugar level and healthy heart. The triple strength action of Nature’s Nutrition Fish Oil Pills earns it a rank among the best fish oil pills available. There are 60 capsules in this pack with 2400mg of fish oil in each capsule. Furthermore, DHA and EPA are ultra-pure to avoid health risks and give you optimum support. This formula is carefully made to provide support for heart, bones and joints so you can lead a vigorous life. The outstanding fish oil supplement is also known to give thicker hair and preserve eyesight which are added benefits of taking them. 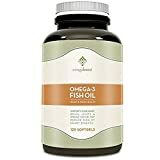 To rank Organa Essential Fish Oil Pills among the best fish oil pills it is important to know that these are high quality capsules made from a triple strength formula to provide you a more concentrated amount of omega-3 fatty acids. There are 180 soft gels in this pack with 1000mg of fish oil per serving. Furthermore, the capsules serve fish oil in triglyceride form to increase its absorption thus making them more useful for you. They are also made with odorless formula with burp-free digestion to give you a clean health alternative. Overall, Organa Essentials Fish Oil Pills are pure and distilled to offer high quality of supplements that do not contain any health risks. To round off this list of the best fish oils pills is a product by Naturo Sciences. There are 120 capsules per bottle with 2150mg of purified fish oil in each capsule along with 1700mg of omega-3 fatty acids, 900mg EPA and 600mg DHA. The fish oil supplement has natural lime flavoring so they are easier to swallow. Overall, this is an extra-strength formula which maximizes the useful effects of fish oil in your diet. These fish oil supplements will help you maintain normal blood pressure, strengthen bones, fight heart diseases and preserve eyesight. It is also useful for healthy skin and hair. By adding the best fish oil pills to your diet you will be taking a proper step towards ensuring health. With help of these fish oil supplements, you will overcome omega-3 fatty deficiencies which have multiple health benefits for everyone.